In today’s world it is likely you will look at 5 or more pool builders before picking a couple to give a call or send an email. 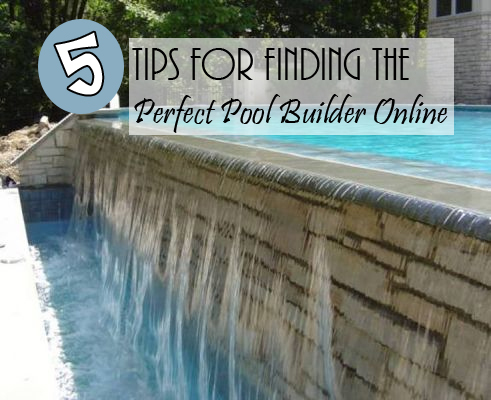 We understand that you are busy and time is valuable so we would like to provide you with 5 tips to use while researching your pool builder online. 1. Don’t assume that the #1 position in Google means they are the best. Google doesn’t rank pool builders by quality or years of experience. The search engine simply crawls the pages of the site and determines which pages are most relevant to your search. Over the years, many pool companies have focused on deceptive practices to elevate their rankings vs focusing on helping their customers. Additionally, to most prominent spot in the search results are often taken up by advertising where companies “buy” that position. We rank well in search, but for a purchase such as buying your new pool it is essential that you take a look at more than just the top search result. 2. Check reviews – but don’t take everything at face value. Check for online reviews of the company but don’t always take those reviews at face value since the reality is the vast majority of any businesses customers are “happy” and never feel compelled to write a review. Also check to see if the company has responded to the reviews and is invested in making sure that negative reviews are taken care of and the customer gets the care they deserve. While even the best companies will have the occasional negative review, you should use those reviews to select questions to ask during your phone call. This will allow you to help drive the conversation and get a better idea of who you will be working with over the next several months. After all, this is not like driving a car of the lot – the pool company you select will be working closely with you for the next several months as they design and build your new swimming pool! 3. Look for associations that the pool builder is part of. Is the company a fly-by-night enterprise that exists in name only – or are they part of trade associations such as the Master Pools Guild and the Association of Pool & Spa Professionals? It is important that you select a pool builder who is trustworthy and invests in their industry – both from a reputation standpoint, but also to ensure that they are aware of all the latest trends and design techniques to ensure their customers can have maximum enjoyment of their new pool. 4. Check the experience level and history of the pool builder. Again, is the pool builder someone who’s business last year was cleaning pools and now they are building them? Or has the company been a leader in the industry for 40 years? You can usually get a pretty good idea of who the company is and what they stand for by checking out their “about” page. 5. Do they have a physical showroom? For an investment of both time and money it behooves you to select a pool builder that has a physical showroom so you can see the quality of their craftsmanship. While each custom luxury pool is unique, the best pool builders will invite you to their showroom to walk you through exactly how different techniques and technologies can be used to help make your dream pool a reality.